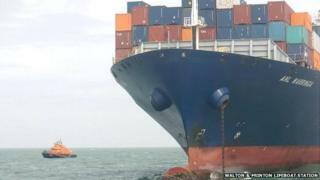 A container ship reported drifting in a major shipping lane off the coast of Essex has restarted its journey. Lifeboats from Walton and Frinton, and the Harwich, were called out to the ANL Warringa when it experienced engine trouble on Saturday. The ship managed to put down one anchor as weather conditions worsened. A lifeboat stayed at the scene ready to rescue the 28 crew if required, but the engine was fixed at about midnight and the ship continued on its way. The ship, reported to be carrying hazardous material, was drifting in the North Sea, 20 miles off the Essex coast, in the key route between Hamburg and the East Coast ports. The ship was on its way to Hamburg from Tilbury.